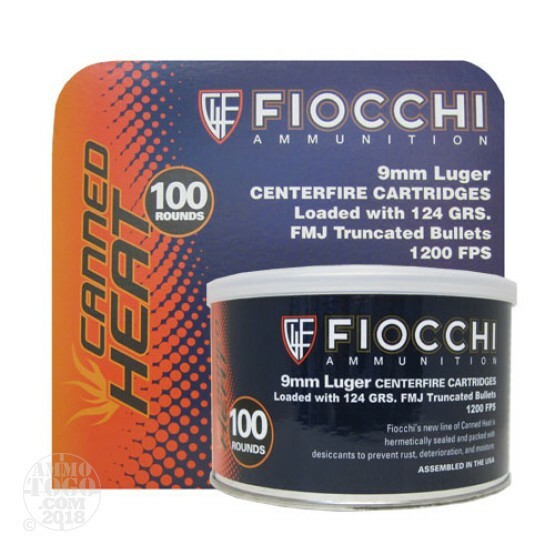 This is 9mm Fiocchi Canned Heat 124gr Truncated Full Metal Jacket Ammo. Fiocchi's new line of Canned Heat is hermetically sealed and packed with dessicants to prevent rust, deterioration, and moisture. Fiocchi centerfire ammunition provides you with premium quality at less-than premium pricing. Quality components are measured and matched to provide reliable, consistent functioning with match-grade accuracy. Fiocchi centerfire handgun ammunition is used by military and law enforcement agencies around the world. All Fiocchi handgun ammo is brass cased and fully reloadable. Muzzle velocity of 1200fps. This ammo comes packed in 100rds. per Canned Heat can.